I don’t know about you, but my skin is always in shambles once the winter rolls around. The cold, dry air mixed with exam season stress is enough to wreak absolute havoc on my skin, and unfortunately, I wasn’t blessed with good skin by anyone’s standards. But, I’d consider myself pretty good at spending money on beauty products, and I just so happen to be very passionate about face masks, so you can take my word for it when I say these are the best face masks to try for an at-home winter skin treatment. The official Tony Moly website sells sheet masks in sets of two for only $6.00, but if you do a little cyber-surfing you could easily find a larger set for an even better price on Amazon. These masks are seriously moisturizing and super inexpensive, which is great if you’re looking for a lot of hydration on a low budget. I don’t know about you, but my skin is always in shambles once the winter rolls around. The cold, dry air mixed with exam season stress is enough to wreak absolute havoc on my skin. While Tony Moly has an extensive repertoire of sheet masks, the Aloe one is well-suited for moisturizing and replenishing the skin. If you’re reading this article and wondering which mask you should pick up first, I’d definitely put this one at the top of the list. While it may be one of the more expensive masks on the list, it definitely lives up to expectations. This mask looks and feels like honey on your skin. It makes removal a little difficult because of its high viscosity, but even so, I found it to be very gentle on my skin. 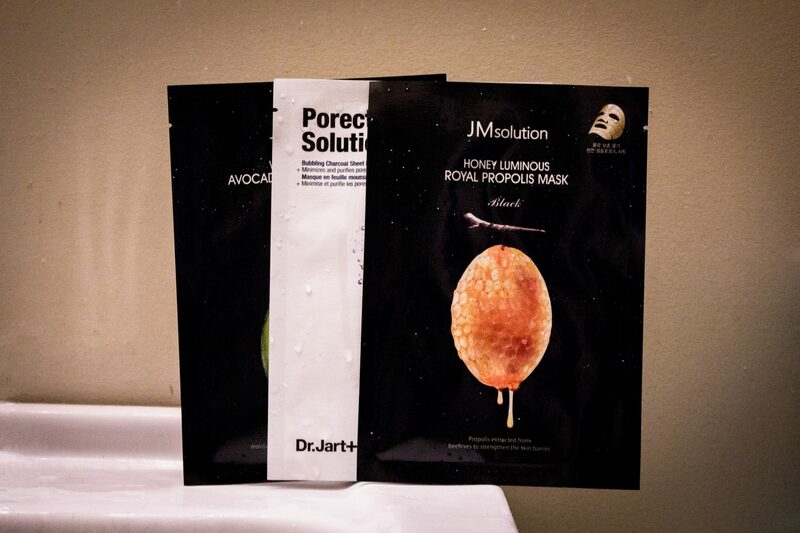 Once you rinse this mask off, your skin will feel super soft and nourished. The mask comes in a cute and dainty jar, and is well suited for multi-ple uses — which justifies the price — as opposed to sheet masks which are typically single use. This mask is also 100 per cent vegetarian, and The Body Shop is known for its animal activist efforts, so you can buy this product and feel good about how you’re spending your money. I’ve used Lush face masks in the past and found them to be extremely drying, but after trying the Oatifix mask, my skin was smoother than I anticipated. The all-natural ingredient list includes fine oatmeal and mashed bananas, which are both known for their soothing and softening qualities. The online customer reviews are mostly positive, but some reviewers noted that the mask was irritating or ineffective for them, so it would be worthwhile to take that into consideration as well. The price is relatively low budget, and you can get a few uses out of it, which is definitely a great feature. I always find sheet masks to be amazing on dry skin because they’re so moisturizing, even when they’re not specifically marketed for that purpose. Freeman Beauty is known for their inexpensive masks, and they have a whole line of Manuka Honey + Collagen Hydrating masks beyond just the sheet masks as well. The collagen properties aim to improve elasticity and the honey aims to soften skin. Out of all the face masks listed, Freeman Beauty definitely has the most accessible masks in terms of price and location, as they’re usually available at Walmart or most drug stores, while the other masks listed are more pricey and could be harder to obtain.